When I picture my readers, they are usually children I know - children I've taught or children whose stories I've weaved into my books. I often have a whole group of children that I have in mind, when writing a book. The other child I imagine is a little version of me. I hope I would have liked my books! When did you come up with the idea for My Brother's Shadow? The idea for My Brother's Shadow came from two places. I worked with a child, who had lost a sibling, whose family had struggled to come through that terrible event. Kaia came from there. The Boy, like in the book, just popped up one day. He simply appeared in my mind, wild and staring. I know you trained as a teacher - are you still teaching, or writing full-time? Do you think being a teacher has helped your writing for children? I still teach. I love teaching and without a doubt, it has influenced my writing. When I'm writing, I'm usually reading chapters or testing ideas on my children. My stories are peppered with characters and scenes that have come from the classroom. The children often have firm views on where the story should go. Sometimes their ideas are gold dust. Often they want a character named after them! I thought the illustrations by Kate Grove were breathtaking, and combined beautifully with your writing to make it a truly gorgeous book. How much input did you have into Kate's illustrations - did you specify which scenes you wanted her to draw, or did she choose? The illustrations are breathtaking. Kate did such a beautiful job. She truly understood Kaia and her story. I had little input. In my mind, I knew I wanted dark and light, dreamlike pictures. I knew I wanted someone to do more than just illustrate but also interpret scenes and ideas in the book. I had conversations with the fabulous team at Andersen. It was a special day when I first saw Kate's work. It is simply perfect. I am biased of course though. True, but speaking as someone unbiased, I agree completely! The relationship between Kaia and her mum, both overwhelmed with grief, is very well-portrayed, while we also get to see how strong Kaia's relationship with Moses was. What are some of your favourite fictional family relationships? Oh. What a great question. The first that springs to mind, although not family at the start, is the relationship that develops between Willie and Mr Tom in Michelle Magorian's classic. The way they move from introverted strangers to family, with delicate steps through their own pain, is so wonderfully portrayed. Another adopted family that I love is that of Todd, Ben and Cillian in Patrick Ness's Chaos Walking Trilogy. The tender care of Ben set against the unknown, sacrificial love of Cillian is brilliantly and gradually revealed to Todd. Another favourite is that of Mina and her mother in David Almond's My Name Is Mina. I love the independence Mina's mum gives her daughter. You mention on your blog that you're a descendant of Henry Avery, known as The King of Pirates. How good a sailor are you - if you were born a few centuries earlier, would you have been on his crew? I'll break it to you now - I'm afraid of open water. Well maybe not afraid, more cautious. My ancestor would be terribly ashamed. I have a completely unfounded fear of shark attack and crab attack and teeny tiny fish attack. I can go in big ships. In fact I love a ferry trip. So maybe I could have been a pirate. I'm a little scared of parrots too though . . .
Do you listen to music when you write? If so, what was the soundtrack to My Brother's Shadow? I tend to write without music. However I did have a Ben Fold's Five song stuck in my head as I wrote My Brother's Shadow - Smoke. Like the book, it's a song about loss and grief. I reread that recently too; a wonderful book! The stage adaptation at the National Theatre is rather different but well worth seeing. 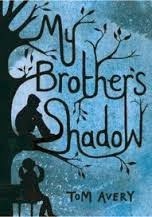 What would you recommend to people who enjoyed My Brother's Shadow, while they're eagerly anticipating your next book? I just finished Liar and Spy and When You Reach Me by Rebecca Stead. Both magnificent. I've been recommending them to everyone who will stand still long enough. Both with excellent twists at the end. I recommend David Almond's work to everyone and will continue to do so. Skellig is the obvious and it's sequel My Name is Mina. I also love the slim, but perfectly formed collaboration with Dave McKean, Slog's Dad. I've just spotted Life An Exploded Diagram on my bookshelf. Mal Peet at his amazing best. Read that too! I've just finished Liar and Spy and after not being all that impressed for the first three quarters or so the ending completely blew me away and changed my thoughts on the entire book. Wonderful. What's next for Tom Avery? I am really excited about my next book. It's a very different setting to my previous books, set by the sea, which plays an important part in the story. It follows twin brothers with a Star Trek obsession and a mysterious interloper into their lives. I can't wait for people to read it and see it. Me neither, sounds fabulous! Thanks so much for talking to me, Tom!